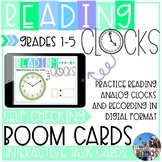 Help students connect clock-face numbers with correct time by placing these labels around your classroom clock. This is a powerpoint used for explicit recalls/ warm ups. As a group students can call out the answers, or use a whiteboard to show the answer. Students recall time to the second. Animations show the answers. This work teaches students how to read analog clocks. Times covered are 12:00, 12:15, 12:30, 12:45, 1:00, etc. This is a 50 page PDF file. Blanks are included so you can create your own custom times. When I create this work for a Montessori teacher, I print on card stock, cut out and laminate. Easy Prep Math Center! 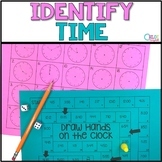 Students practice matching Digital time with Clock Pictures. 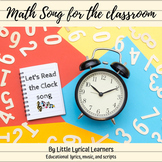 The recording sheet challenges students to think about the time before and time after. Hope you enjoy! 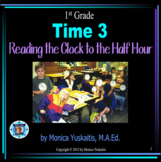 Tic-toc Reading a Clock - PART ONE - Tell time in no time! 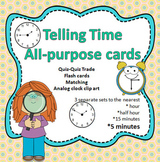 Introduce your students to the world of telling time! 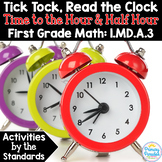 Worksheets are broken down by hour, half hour, quarter hour, and minutes- your students will be telling time... in no time! *Includes a Teacher's Key for easy grading! 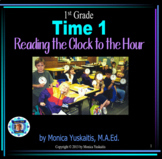 Reading a Clock Tic-Tac-Toe Have your students practice reading clocks in a fun way. This file includes a tic-tac-toe style game with an answer key. ***Please check out my other tic-tac-toe games on different topics.